In Wolfpack Pays video slot game from NextGen Gaming you can go where no man has been before. Unleash the wolves’ power and count your wins as you spin the see through reels that reveal the beauty of our planet Earth. With each win the music will build up to a crescendo adding suspense and thrill. In Wolfpack Pays we can see something different when it comes to the special features. But let’s start with our familiar wild symbol which is the leader of the wolf pack. It appears only when the feature starts and it will substitute for every other symbol in this game. 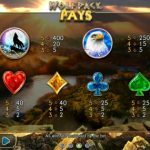 The special feature is integrated in the base game and it is called Wolfpack On A Roll. Namely, every time you land a win you will receive a free spin with an extra wild. 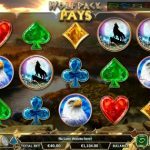 With every consecutive win you receive one respin and one wild until you reach the fourth spin which will also activate the free spins. 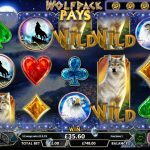 You will receive an unlimited numbers of free spins with 5 extra wilds added to the reels, which sounds magnificent. The feature will end once you get 3 non-winning spins which are marked with the paws on the top left corner. Wolfpack Pays offers so much fun and excitement to everyone who decides to play this game. We have to say that this is NextGen Gaming’s masterpiece. We love every aspect of the game. The design is impeccable paired with the sound effects. Then we see that they really managed to add something new to the game when it comes to the special features too. The only thing that is left unsaid here is that you have to give this game a chance and see it for yourself. For another great engaging game you should consider playing Wildcat Canyon a 5 reel slot by NextGen.